Guangzhou is a sprawling port city northwest of Hong Kong on the Pearl River. The city features avant-garde architecture such as Zaha Hadid’s Guangzhou Opera House (known as the “double pebble”); the carved box-shaped Guangdong Museum; and the iconic Canton TV Tower skyscraper, resembling a thin hourglass. The Chen Clan Ancestral Hall, a temple complex from 1894, also houses the Guangdong Folk Arts Museum. 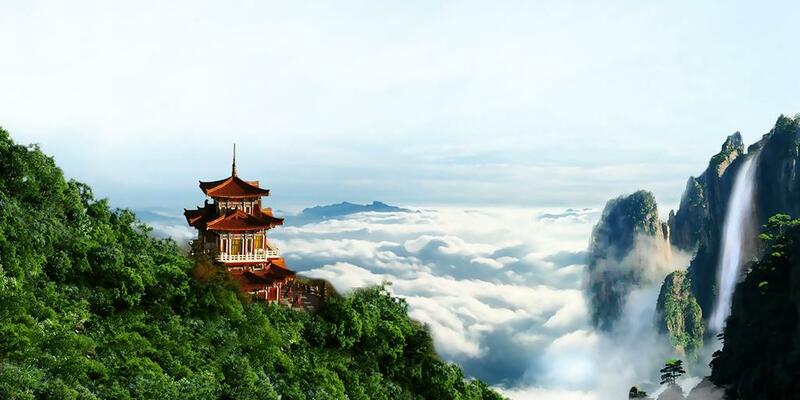 From ancient times, White Cloud Mountain has been one of the most famous spots of natural beauty in Guangzhou, and it's still known as the First Spectacular Scene of the city. Every time the sun shines after the rain, and through late spring, a wreath of airy clouds circles the mountains. This is how White Cloud Mountain has won its name, and its reputation as a marvelous spectacle of nature. The fierce differentiation of rocks, and the different ways in which erosion has affected them, has caused it a crisscross network of gullies. So its relative height is now about 100 meters (109 yards). The quiet and secluded environment of the valley has made it a haven of peace from the big city. 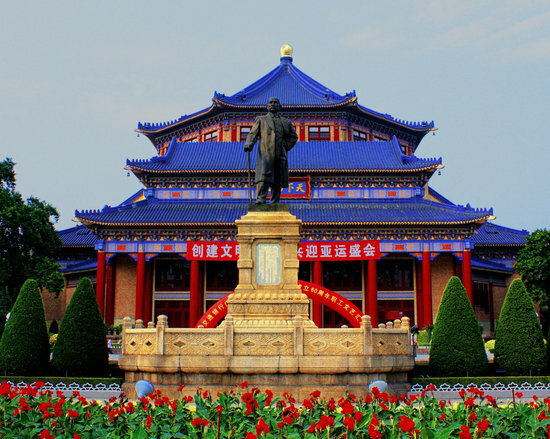 The Sun Yat-sen or Zhongshan Memorial Hall is an octagon-shaped building in Guangzhou, the capital of China's Guangdong Province. The hall was designed by Lu Yanzhi and was built with funds raised by local and overseas Chinese people in memory of Sun Yat-sen. Construction work commenced in 1929 and completed in 1931. The hall is a large octagonal structure with a span of 71 meters without pillars, housing a large stage and seats 3,240 people. 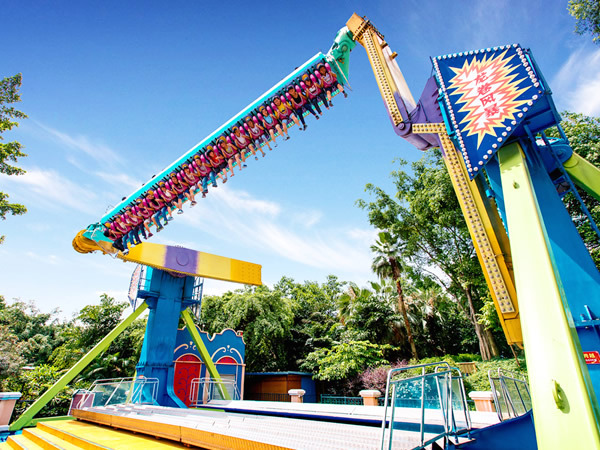 Chimelong Paradise is a major amusement park in Panyu District, Guangzhou, Guangdong, China. Opened on April 12, 2006, Chimelong Paradise is the largest amusement park in China and boasts the 10 Inversion Roller Coaster, which prior to the opening of The Smiler at Alton Towers, England shared the record for most inversions with Colossus at Thorpe Park in Surrey, England. It is classified as a AAAAA scenic area by the China National Tourism Administration. 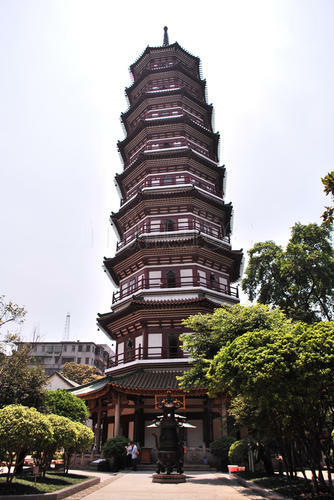 Having a long history of about 1,400 years, the Temple of the Six Banyan Trees is one of the four best Buddhist temples in Guangzhou and located on the Liurong Road (meaning the Six Banyan Trees Road). It has a rich collection of cultural-relics and is renowned both at home and abroad.